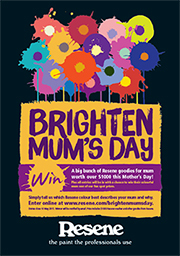 Brighten Mum's day | Win a big bunch of Resene goodies! Win a big bunch of Resene goodies for mum worth over $1000 this Mothers Day! Plus all entries will be in with a chance to win their colourful mum one of our fun spot prizes. Simply tell us which Resene colour best describes your mum and why. Entries close 12 May 2019. Winner will be notified by email. Prize includes $1000 Resene voucher and other goodies from Resene.